The event last night was a blast! 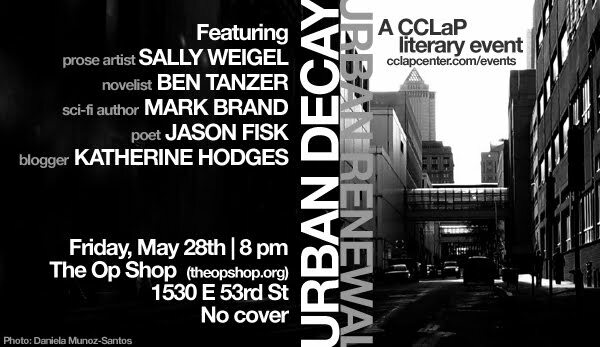 I was honored to be invited to read part of The Damnation of Memory for the CCLaP's first live event, and the show's producer, Jason Pettus, has a real gift for putting together a group of writers. The five of us clicked immediately and much fun was had by all. It's a huge treat for me to get such a warm reception like that from authors I respect. I highly encourage everyone to check out the websites of the four other participants, Ben Tanzer, Katherine Hodges, Jason Fisk and Sally Weigel. They're terrific people and their work is outstanding. So the podcast from the event will be available early next week and anyone who is interested will be able to get their first sneak peek at a segment from The Damnation of Memory. Awkwardly, I had a ticklish/sore throat all week and it reared its ugly head, causing me to cough and hack a few times during the reading, but all in all I think it went well. I'll post a link here for the podcast once it's up, and I think there'll be a text link as well. 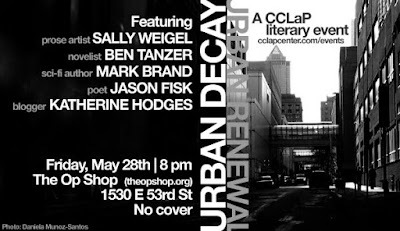 A big thanks to Jason Pettus and the Chicago Center for Literature and Photography for the invite! Also, this event ended up getting some significant press from Gaper’s Block, Chicagoist.com, Time Out Chicago, and the Chicago Tribune’s ChicagoNow blog network. Hey man, thanks for the shout-out, great meeting you in person and looking forward to the new book.